Pope Francis with Ban Ki-moon in April. Photo credit: Reuters / Osservatore Romano. Pope Francis, who released an encyclical on the environment this week, and who will make a major UN address on sustainable development in September, has vowed to fight climate change denial. In April he teamed up with General Secretary, Ban Ki-Moon, to shout down those voices denying man-made climate change. Ki-Moon opened the one-day conference of scientists and religious leaders called “The Moral Dimensions of Climate Change and Sustainable Development”. 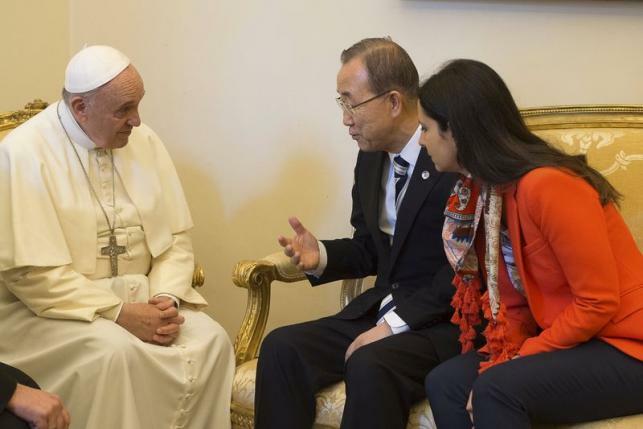 Before that the UN Secretary-General and the Pope had discussed climate change. Opening the conference in April, with some 60 scientists, religious leaders and diplomats, and hosted by the Pontifical Academy of Sciences, Pope Francis urged industrialized countries to invest in clean energy and to reduce their carbon footprints. He stated: “Mitigating climate change and adapting to its effects are necessary to eradicate extreme poverty, reduce inequality and secure equitable, sustainable economic development”. A joint clarification was agreed at the conference, stating that human induced climate change is a scientific reality, and that mitigating efforts should be a moral and religious imperative for humanity. The impact which the Pope can make will be enormous as his encyclical is delivered to 1.2 billion Roman Catholics, and he hopes that this will influence the crucial Paris summit at the end of the year. The climate change-denying think tank The Heartland Institute is not best pleased with the Pope’s movement on climate change, and sent a delegate to the Rome conference in April. They said that believing in man-made climate change is a poisonous ideology, and the Pope should listen to the scientific arguments. Regardless, Pope Francis is set to be the first Pope who has actively engaged with the issue of tackling climate change. His leadership on this issue is upsetting many conservative politicians and religious groups, primarily in the USA’s bible belt, where the majority do not believe in human induced climate change.